Powderpost beetles are second only to termites as destroyers of seasoned wood, such as that used in buildings and furniture. There are several kinds of powderpost beetles, but they all damage wood in about the same way and require the same control measures. The most common species in Indiana is the Lyctus beetle, which attacks the sapwood portion of hardwoods such as oak, hickory, ash, and walnut. Other species feed in heartwood as well as sapwood, and will also attack pines and the softer woods. The surface of powderpost beetle-infested wood is perforated with numerous small “shot holes,” each about the size of a pencil lead or slightly larger. Any slight jarring of the wood causes a fine, flour-like powder to sift from these holes. When cut or broken, the interior of infested wood may reveal masses of this finely-packed powder. Sub-flooring, hardwood flooring, joists, sills, plates and interior trim are the parts of buildings most frequently attacked. Other wood products like hickory furniture, implement handles and ladders may also be damaged. If infestations in wood are not treated, the structural strength of the wood can eventually be seriously depleted. Powderpost beetles are small (about 1/12 to 1/5 inch long) and usually reddish-brown to nearly black. They emerge from infested wood from late winter through early summer. During this time, the females lay eggs in the wood pores. These eggs hatch into tiny curved grubs that eat into the wood, packing their burrows with the finely pulverized wood. When fully grown, the grubs go through a pupal stage and once again emerge as beetles. Powderpost beetles require from a few months to several years to complete one generation, depending on the species and the starch content of the wood. 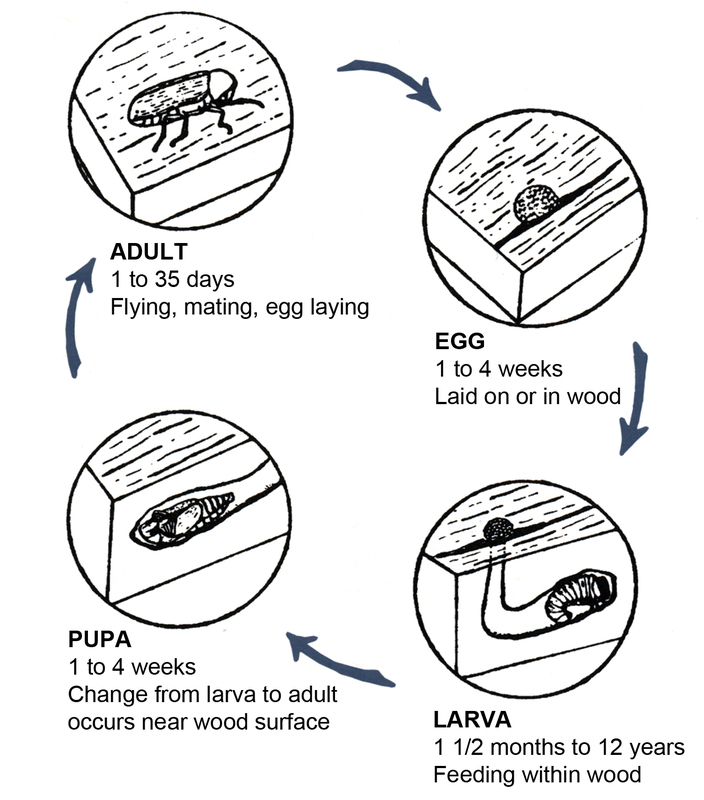 The typical lifecycle of a lyctid powderpost beetle. 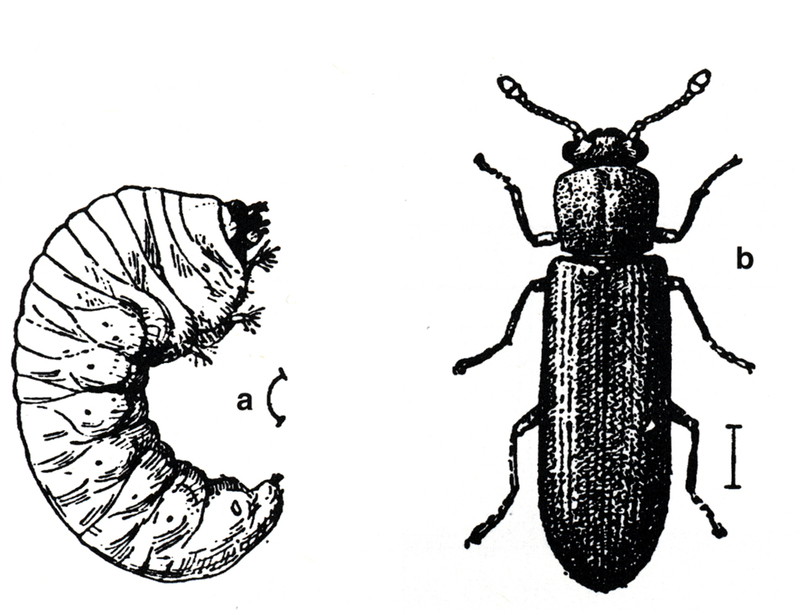 The larval, or grub stage in which the wood-destroying beetles do their damage, is long in proportion to the rest of the life cycle. Permethrin, cypermethrin, and cyfluthrin are examples of pyrethroid insecticides (listed as the active ingredient on the label) available as emulsifiable concentrates (EC) that can be diluted by mixing with water according to label directions. Control powderpost beetles by spraying or painting infested wood with one of the above mentioned insecticides. All surfaces being treated must be thoroughly wetted for effective control. This type of treatment will kill emerging adults rather than larvae since the insecticide will penetrate only slightly into the wood. Treating during the spring of the year is the best time since the adults are emerging from the wood at that time. Several treatments may be necessary; if fresh powder is seen a week or so after treatment, the insecticide residues have dissipated and need to be replenished by another treatment. Care should be exercised in treating hardwood floors and other finished surfaces to avoid marring the finish. If in doubt, treat a small, hidden area first. Most wood-infesting beetles will not reinfest wood that has been painted or finished in some way. However, beetle larvae in finished wood will mature and emerge as adult beetles, leaving the characteristic “shot holes” on the surface of the wood. Wooden items can be cooled to 0°F for several weeks or heated to 150°F for 4 hours to kill infestations, but care must be taken not to damage the wood in the freezing or heating process. Many dependable and experienced pest control companies provide effective powderpost beetle control services. If the infestation is extensive in a structure or in hard to treat areas, it may be necessary to fumigate. Professional pest control will be required for these situations.